Is Your Book a Dummy? It Should Be! Book dummy. Kids laugh when I say this. New writers might think I’m insulting their story. What exactly is a dummy? And where, I wonder, did the flattering term come from? In the publishing world, it’s a manuscript that’s laid out in book form, with one or two pieces of finished art. It’s an important tool for author/illustrators who want to show their story with some of the art. But dummies can help us non-artistic, picture book and easy reader writers as well. I think dummying out a manuscript is one of the best tools at a writer’s disposal. I frequently dummy out my stories after that initial feeling that it’s finished (usually around the third or fourth draft). Once the story has gelled and I have a strong sense of the plot, I know I need to work even harder on word choice, pacing, flow and finding those defining page turning moments. And that’s where a dummy can help. How do you make your manuscript a dummy? Don’t send it to school! (ha-ha). Okay, seriously… It’s simple. All you need are eight sheets of blank paper, a stapler, your manuscript, scissors and removable tape (sounds like art class, huh?). 1. Collect the 8 pieces of paper (doesn’t really matter what size, but I use 11 x 14” legal size). 2. Cut them in half (midway down the long side). 3. Staple them together. You know have a mock-up for a 32-page picture book (standard length for most picture books–the exception being 48-page books for older readers). Now comes the fun part. Take a hard look at your manuscript. Try to envision it in scenes. Remember, a picture book has 13-15 page spreads, so you’ll have to have at least this number of scenes in your story. Okay, back to envisioning… You can either play around with where the scenes fall by marking it with a pencil, or you can start cutting. 4. 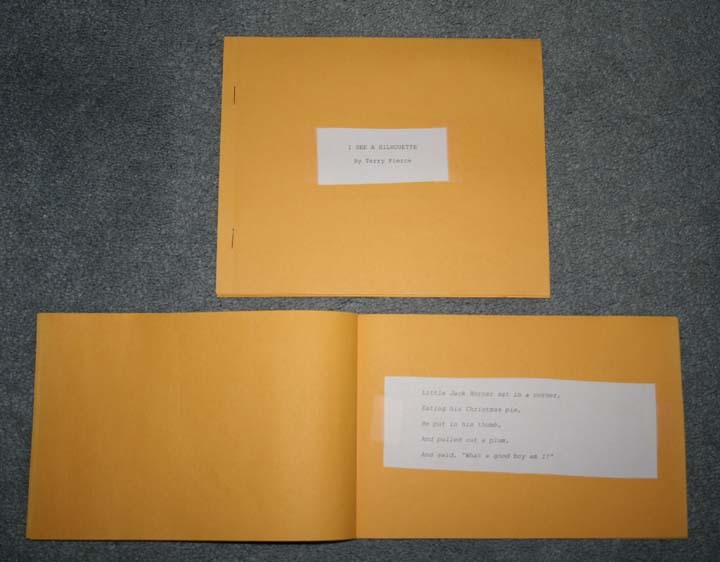 The “cover” of your dummy is where the title page of the actual book would go, so cut your title out and tape it there. 5. The next page is where the copyright info and dedication usually go (on the left-hand side of the page spread), so I just note © on that page. 6. Then, depending on how you envision your story beginning, you can begin cutting and taping your manuscript. If you have a short, snappier start, you can start it right there on page 3. If you see it as a scene that requires a full-page spread, then go to page 4-5. 7. Continue cutting and taping, playing with it until you’ve worked it into the full dummy. I guarantee you’ll find spots that scream they need more revision, and others that will fit perfectly. Wordy scenes will stand out, sparse scenes will too. You’ll discover some great page turning places that will carry the suspense and add to the tension. 8. Once you’ve make changes to the dummy, add the changes to your manuscript. Okay, now here’s the hard part. As much as you now looooove your dummy, DO NOT send it to an editor. This is a learning tool for your eyes only (or your critique group). Editors do not want to see our cut and tape efforts (unless they specifically ask for it). Really. Cross my heart. After I’ve made the changes to mymanuscript, I put it away for a few days. Then I go back and start over (read, make changes, dummy it out again). I usually end up with 3-5 dummies per story I write. I hope you find this as useful of a tool as I have. Happy dummying! Hey, I’m a dummy for not doing a dummy. Love this. Thanks!Am I going to be seeing you at the Santa Barbara PB Retreat? So smart … I haven’t been doing those very faithfully (which, I guess, would qualify me for the same thing Jill said … I’m a dummy for not doing a dummy!!! :-)). Thank you for the great reminder! And, I love your book … and the publisher … Sylvan Dell is one of my absolute favorites! I’m so glad to hear that it helped you, Rebecca. It really is a great tool for PB and easy reader writers.